Throughout our travels around Istanbul and Cappadocia during our Turkey Trip, one common thing that accompanied me all through was Türk Kahvesi or Turkish coffee! My initiation to kahvesi began onboard the Bosphorus cruise. The coffee appeared like tar, a brown-black sludge. But willing to experiment, I tasted it quite willingly. Kahvesi was quite literally an assault on the senses on the first sip, but by the second sip, I fell in love with it completely, and absolutely. And by the third sip, I was ready to kill and maim for one more cup of kahvesi. That is the magic of this dark, bitter-sweet elixir. Until the year 1554, in the High, God-Guarded city of Constantinople, as well as in Ottoman lands generally, coffee and coffeehouses did not exist. About that year, a fellow called Hâkem from Aleppo and a wag called Şems from Damascus, came to the city: they each opened a large shop in the district called Tahtakale, and began to purvey coffee. And in 1538, when the Ottoman Turks annexed Yemen, they gained a monopoly over coffee trade. They parboiled coffee beans and exported them from a Yemeni Red Sea-port town called Mocha,. And thus came about the term "mocha." 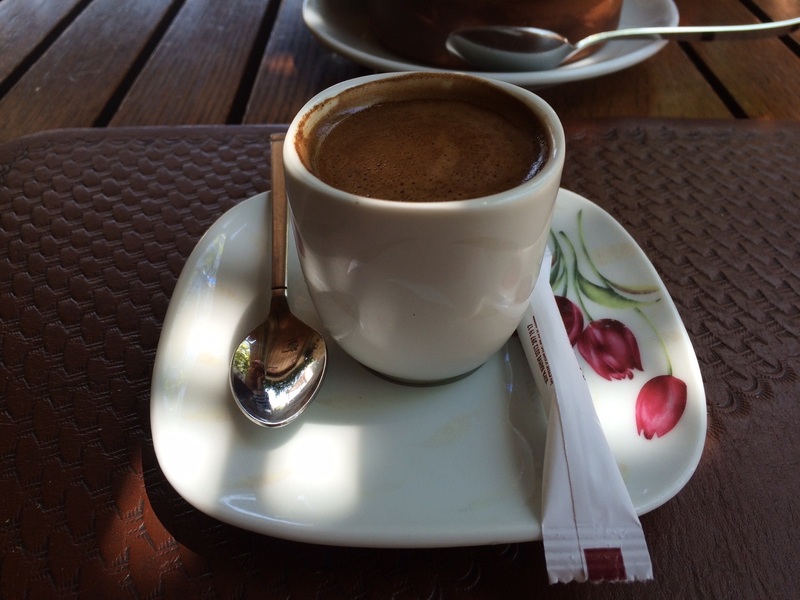 Today, coffee is very much a part of Turkish everyday life and traditions. It is also a part of traditional Turkish wedding customs. Before the wedding, when the groom and his parents visit the girl's family, the bride must prepare and serve them coffee. And the fun part - for the groom's coffee, the bride use salt instead of sugar to gauge his character. If he drinks his coffee without any sign of displeasure, the bride assumes the groom is good-tempered and patient. And the Turks use coffee for fortune-telling or kahve falı - the sediment left after drinking is turned over onto a saucer. They believe that the patterns of coffee grounds can predict your fortune! But who cares about the future, when you have excellent kahvesi this very moment. And I fully agree with this old Turkish proverb that says “Coffee should be black as hell, strong as death, and sweet as love”.